The first day of the workshop at Concordia was outstanding! I really am happy. There were far too many teachers for everyone to be able to teach and get coaching, but one of the groups who was assigned the Group 1 lesson did their teaching. It was good to see that other teachers with other teaching styles can do TPR Storytelling and be effective. Also giving the entire group a chance to work together on a lesson enabled them to get their questions answered and so imagine themselves teaching using CI. 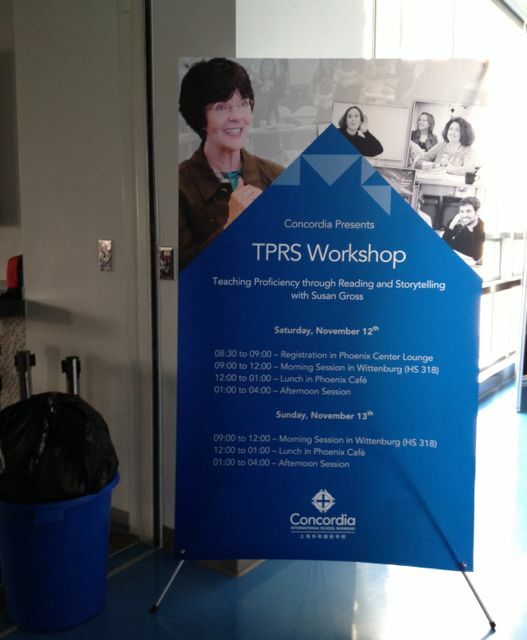 Ever since I got here, the entire school has been plastered with huge posters of ME — advertising the workshop. But today they added a big life-sized poster! I feel like such a celebrity. Here is a picture of the big poster. In the evening, LanYing and Don McQueen took me to a wedding. One of the American teachers at the school married a beautiful Chinese woman. I wish I had taken my phone so that I would have pictures of the event! It was really fun. The bride wore a series of wedding and traditional-style dresses. The groom also changed into different suits to go with the bride’s choices. It was almost like a style show, with music and an MC to animate the whole event. Like our son Chris’s wedding, there was an MC and a bubble machine! The food came in courses and it was amazing. We ate and ate. We saw slide shows of the youth of the couple, we heard lovely speeches from their parents that welcomed the new couple into the family. Then the music got lively and everybody danced! From little kids to old folks like me! Really a lot of fun.